Montalcino, in the province of Siena, is renowned all over the world for the Brunello, a wine produced on the hills that surround this charming Tuscan town. In the 16th century, when Florence defeated Siena after long and bloody struggles, many noble families fled from their city - which had lost its independence - to Montalcino, where the Republican government survived another four years. 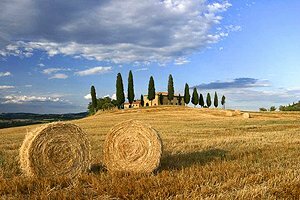 Our agency is specialised in renting holiday villas and country houses in Siena and in Tuscany - villas with and without swimming pool, luxury villas in the green Tuscan countryside, ancient farmhouses that have been renovated and transformed into villas and farm holiday apartments. Are you planning to spend your holidays in the gorgeous Sienese countryside? 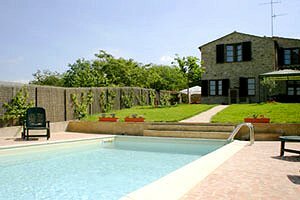 In our website you will find a wide selection of holiday country houses in Montalcino among which you will certainly find the one that meets your requirements. 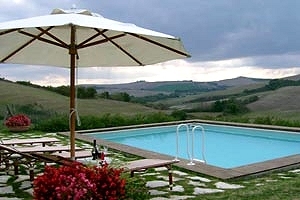 Farmhouse with swimming pool in San Giovanni d`Asso, in the Crete Senesi, in the province of Siena. 8 sleeping accommodations, satellite TV, large fenced garden. Old farmhouse sleeping 8 people in the Crete Senesi region, in Monteroni d`Arbia (Siena). Swimming pool, garden, Internet connection, air conditioning. Magnificent panorama. Riding stable, golf club and tennis courts nearby. 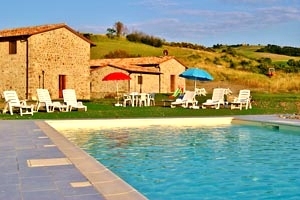 Beautiful farmhouse sleeping 18+7 near Bagni San Filippo (Siena), in the Valdorcia Artistic, Natural and Cultural Park. Wide garden, swimming pool, Internet connection. Tennis club and riding stable in proximity. Recently restored farmhouse in Siena countryside, near Pienza, Montalcino and Montepulciano. 4 beds, wide garden, private swimming pool, Internet connection and wonderful panorama. 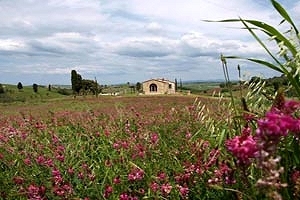 House for rent for holidays in Pienza, in the countryside of Siena in Tuscany. The house (ex farmhouse) offers a pleasant accommodation for 8 people. Swimming pool, table-tennis table.